The Order Form for flat-pack Shoeboxes is now available by clicking here. It would be appreciated if the completed form could be returned to the District Shoebox Coordinator Ron McKail before the 31st August. Flatpack boxes will be available for collection at the District Council meeting in Dundee on Sunday 23 September. Orders of 500 boxes will by arrangement between clubs and the Shoebox Charity be delivered to a named address prior to this date. As District places a bulk order the cost per box is being held at 90p per box. If those filling the shoeboxes tape a £1.00 coin to the box lid this £1 coin is for the retention of the club which in turn helps to offset the cost of purchasing the boxes. Filled boxes should be sent to Dyce Carriers, Aberdeen, and to SPECTRAGLASS, Perth, during the week 19 - 23 November, 2018. See the “2018 Rotary Shoebox District Assembly presentation” here. 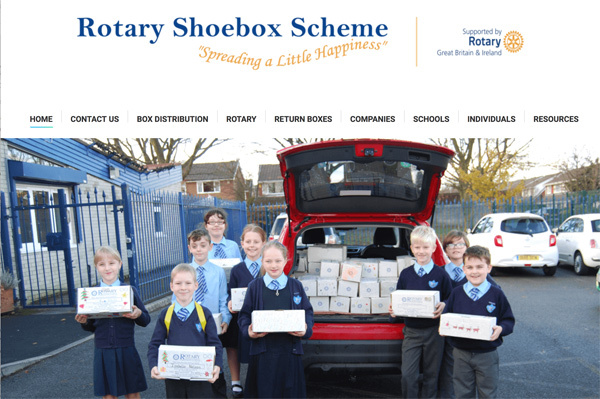 See Rotakids Shoebox film clip here, by the Aberdeen Quarryhill Primary School RotaKids Group. Our team would like to thank you and tell you about Christmas celebration of many Ukrainian children and adults this year.